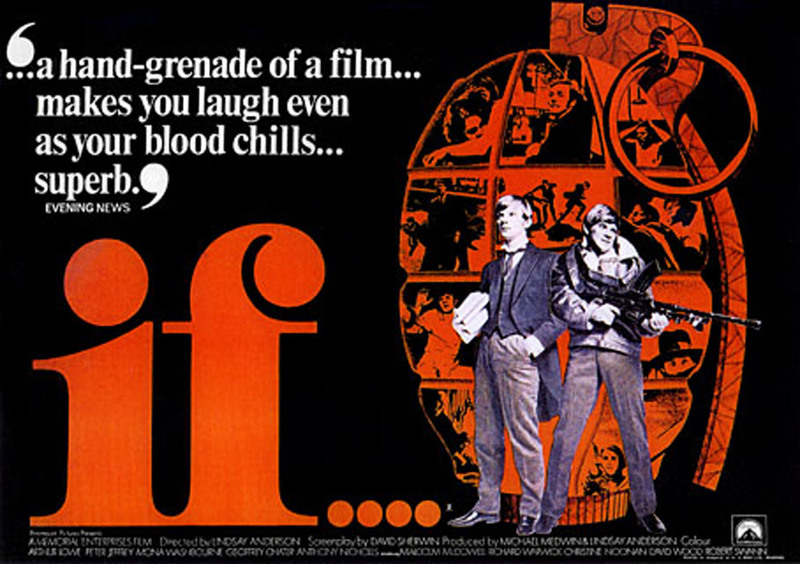 Lindsay Anderson’s “If…” (1968) is not only one of the most underrated British films but also one of the most controversial at the time of its release, derided by Lord Brabourne as ‘the most evil and perverted script I’ve ever read. It must never see the light of day’. Created in a decade strewn with revolution, change and turmoil the film is a microcosm of the social upheaval happening around the globe. Now the film is considered a classic and was recently described in the Observer Newspaper as one of the ‘most powerful and daringly inventive British films’. The long term admiration and success of “If…” is born out of its frank and desperate portrayal of life at an English boarding school and the desire to go against the norms, the fictional establishment could be any of the archetypical public schools of Eton, Charterhouse or Cheltenham College (The director’s old school). The theme of youth in revolt against the domineering adult society is one that has been addressed countless times before in film but rarely has it been depicted with such realism, any student can relate to Travis’ plight and resentment of an educational system that leaves no room for creativity or expression. Although the film’s overarching theme is youth rebellion the film acts as an effective satire of English public schools methods as well as a critical look at the flaws in the hierarchy of social class, especially the privileged ‘elite’. Throughout the film there is constant commentary by school’s headmaster on its success at crafting the finest members of society as ‘those who are given most also have most to give’. The irony of his belief that college is an ‘exciting place’ where ‘the muscles of creativity are flexing’ and ‘opinions of imagination twitching’ amongst the students, his allusions echo the exact opposite of Travis and his fellow pupils’ experiences. When lecturing Travis for his questionable behaviour the headmaster compares his unruly actions to ‘deplorable scruffiness’ and that he understands the desire to express one’s self at school completely missing the much darker, violent desire for change. The classic tale of adults failing to understand the alienated youth is emphasized at its most volatile here. The film is constructed in a wholly unique way, shown throw the eyes of our anti-hero Travis, it jumps between gritty realism and moments of inexplicable surrealism. At one point Travis assaults the school priest and ends up apologising to him as he comes out of a drawer in the headmaster’s study, these instances of fantasy are placed nonchalantly throughout the film leaving the viewer questioning what is actually real and what is in Travis’ mind. This fine line between reality and the imaginary is blurred further by shifts to black and white filming at almost entirely random points in the film. Instances like this force the viewer to question each scene in the film as to whether what we are seeing is in fact a reality stranger than fiction or just the hopeful fantasies of a disillusioned school boy. The film consistently addresses the nature of war, violence and revolution throughout, acting as a precursor to the dramatic finale. Travis’ admission that ‘there’s no such thing as a wrong war, violence and revolution are the only pure acts’ hints at the bloody end to come when the despicable school authority receive their comeuppance. The film’s conclusion is powerful and shocking in its direct execution, creating the ultimate student retaliation against the establishment. Now considered a masterpiece of British cinema the film has been hugely influential amongst renowned film makers. After seeing “If…” Stanley Kubrick immediately cast the young Malcolm McDowell has the ultraviolent lead, Alex, for his upcoming picture “A Clockwork Orange”. Martin Scorsese loved the film so much that he named Robert De Niro’s character in “Taxi Driver” Travis after the protagonist of “If..”. Forty years on and “If…”still retains its power as one of the great films of British cinema; more evocative in its anti-establishment message than “The Wild One” or “Rebel Without a Cause” and coupled with McDowell’s landmark performance makes this a timeless classic that still shocks as much as it did in 1968.